If you’ve visited my blog recently, you may have noticed the Extra Life banner that I added under the header image. Well this past weekend was indeed the Extra Life event and I was so happy to be able to participate, even in a slightly different way. Most people were doing the 24-hours of gaming marathon on Saturday but I decided to split it up into 2 12-hour parts on Saturday and Sunday. This allowed me to fit in my twice-daily carpal tunnel stretches and give my wrists a rest in between. Friends and family kindly donated to support the cause and I was able to raise $600 for The Children’s Hospital Foundation of Manitoba! Before I get any further, I’d like to announce that I will be participating in IntPiPoMo for the first time ever. You can read more about it on Gamer Girl Confessions but to sum it up, it’s a challenge to post 50 pictures in the month of November. While they can be any type of images (photos, art, animated GIFs), I’m going to go with screenshots because I have a load of them. 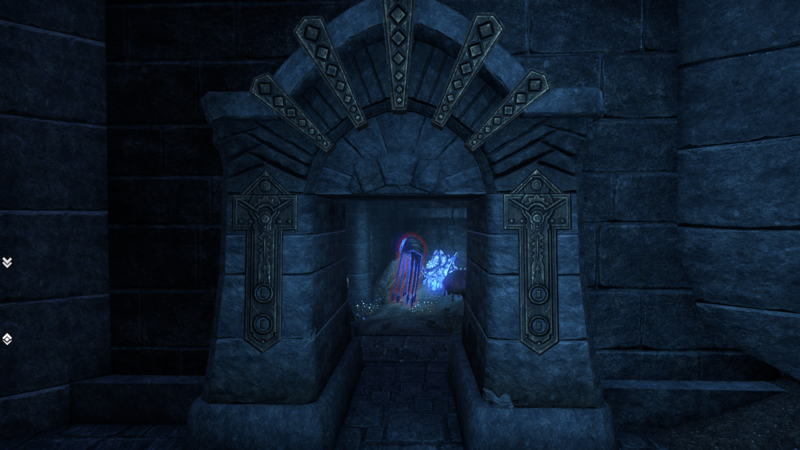 I have a whole bunch of them that have been sitting around for a while, waiting for me to get around to writing up a post for them or were taken for no particular reason other than it looked cool. So now I have an excuse to finally get through some of that backlog. What does IntPiPoMo have to do with Extra Life? Well, I have some Extra Life-related screenshots to show you and what better way to kick IntPiPoMo off, am I right? 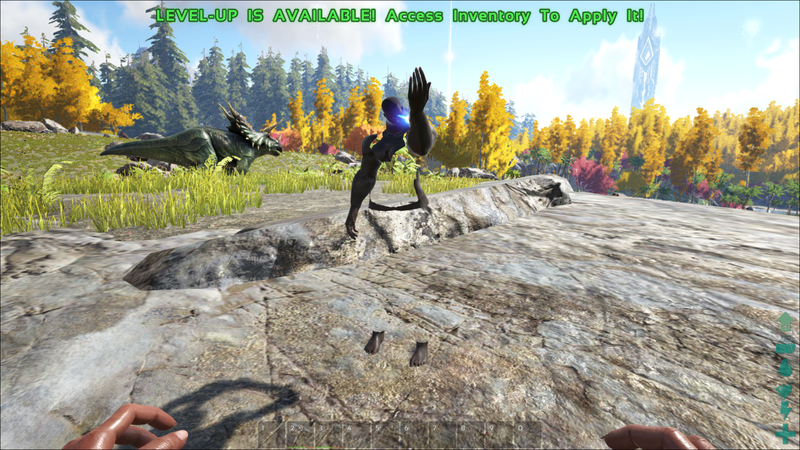 So Lord Crumb joined me for most of Extra Life and on Saturday, we began by playing Ark: Survival Evolved together on a server I created. I actually forgot to take screenshots during this time but some that I took before will have to do. This was Lord Crumb’s first time playing the game and he had a little too much funny playing around with the character creation sliders. I will admit to finding the name Minnie Head amusing. 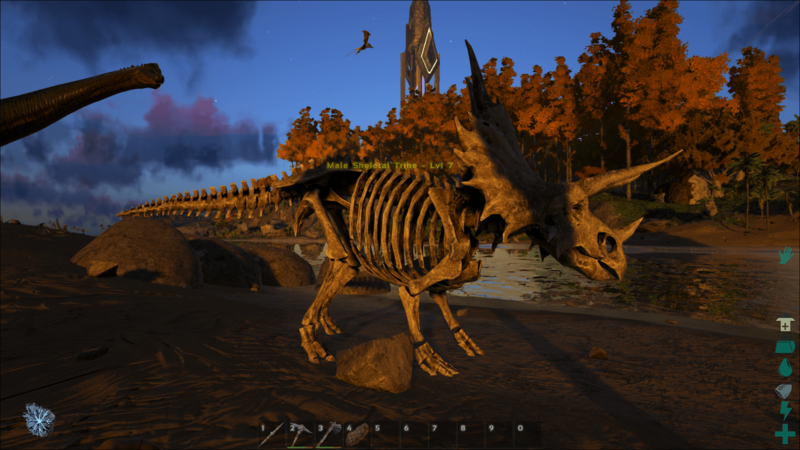 The ARK Halloween event was still going and there were quite a few skeletal dinos wandering around, like this triceratops. And there was also a glitch or two. Sunday started with me playing some RimWorld solo while Lord Crumb was busy cooking. I was live-tweeting screenshots as I played so I feel it would be cheating to use those images again here. 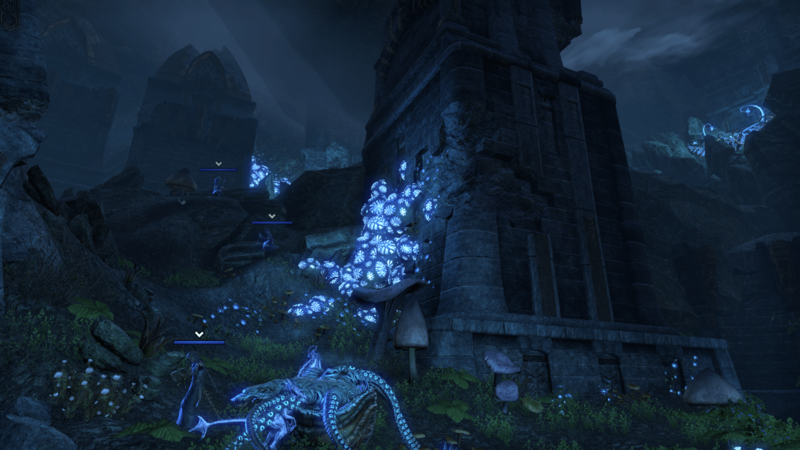 Later on in the day though, Lord Crumb and I logged onto ESO, where we teamed up with Tyrannodorkus and his brother to tackle some dungeons. 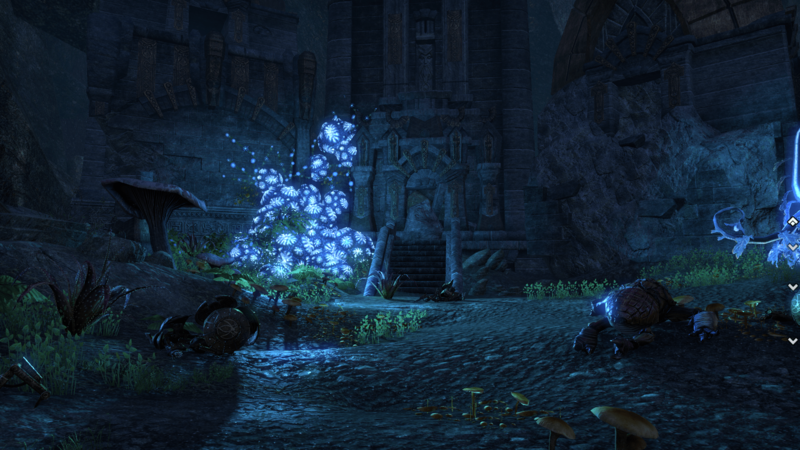 One of them was Darkshade Caverns, a kwama mine that was also part dwarven ruins. 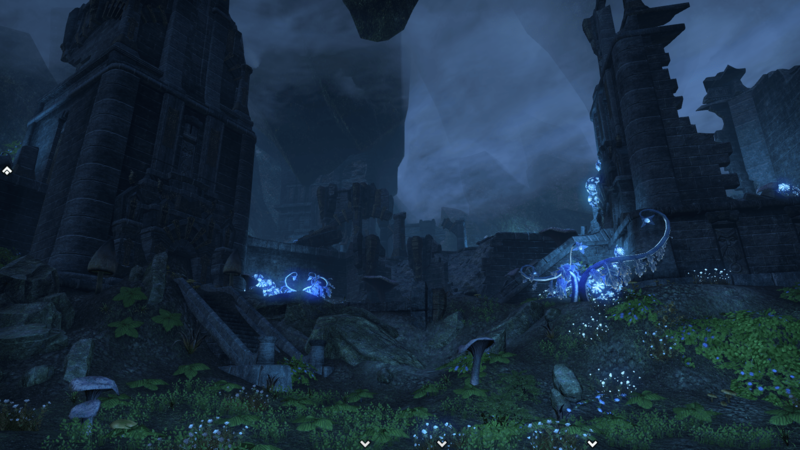 The dim blue lighting was very atmospheric and reminded me of some of the caves I’ve seen while playing Skyrim. 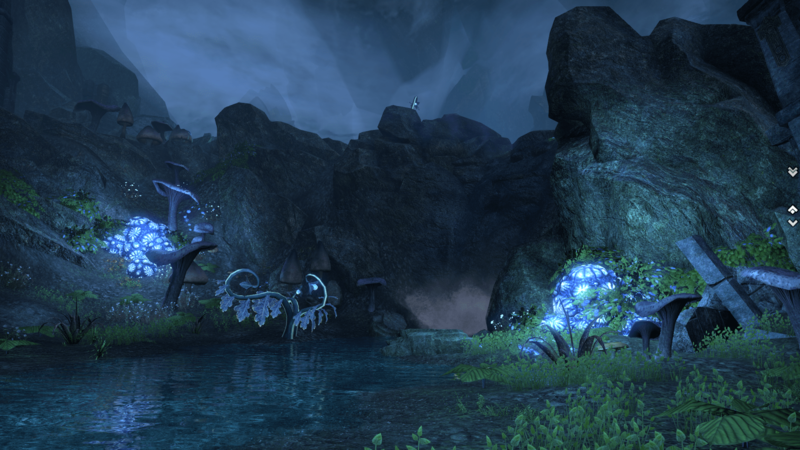 Have I mentioned lately how pretty ESO is? 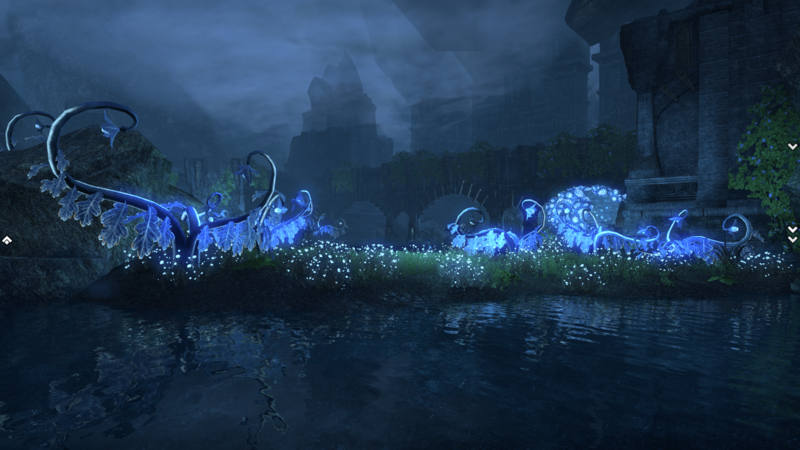 Because it’s very pretty, which is why there will be more screenshots from it in future IntPiPoMo posts.